I know that it's been ages since I posted any new sewing. I have been working more than I ever intended to since being employed again. I've actually been wearing this dress for weeks already but have been trying to find the time to chronicle it. The pattern for this dress was really born out of necessity. 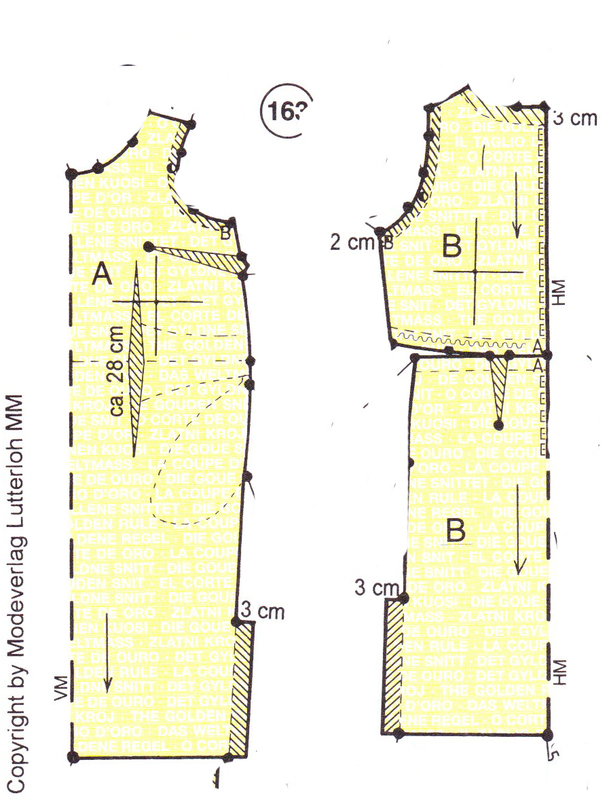 I looked through all my Lutterloh patterns, more than once, but I could not find a pattern for a basic T-shirt type dress with no bust darts. I know, I could just rotate the bust darts as Fonnell explains here. However, why not use some patterns that I already have drawn and combine them to create my simple pattern? 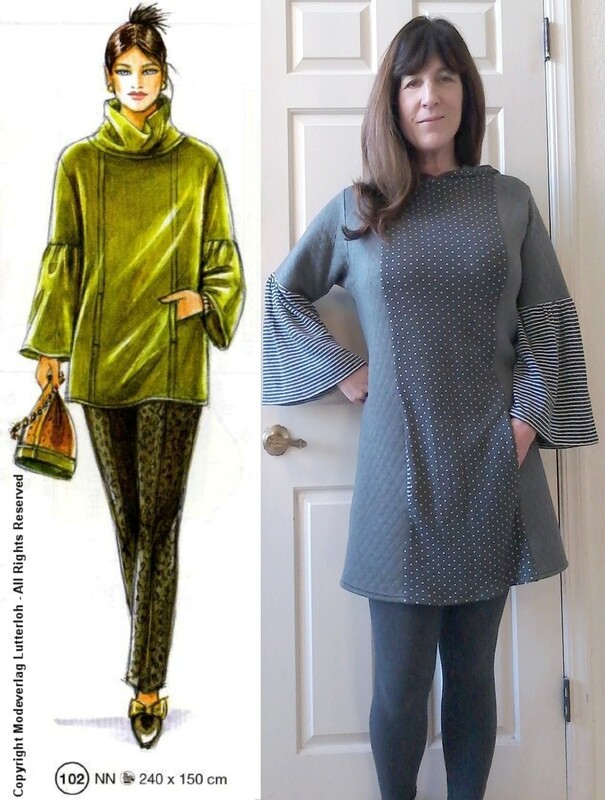 With this style of dress once you have the pattern and fit worked out it's so easy to use it again and again. Now this may sound like more trouble than it's worth but bear with me and you'll see it's not that complicated. The only real challenge was to combine the top of the shirt with the skirt of the dress pattern. You'll see in my photos below that it's not really a challenge after all. I first laid out the two patterns with the dress pattern on top. Since they are similar shapes and both drawn to the same size you can see that there isn't a great deal of difference until you get to the neckline. With the center back lined up and the waist line matching on the two patterns there's just a slight flare at the bottom of the shirt pattern that needs to be folded in. Of course when I drew the pattern these pieces were on top of a new piece of paper but the dark background gives a better contrast. I folded in the extra shirt pattern and started copying the skirt but only up to the waistline. Once I got the whole skirt drawn to the waist I then folded the dress pattern at the waistline and anchored it with a huge pattern weight. I needed to be sure the center backs stayed aligned while I copied the shirt on top. I had already used this same bodice and sleeve pattern together so I knew there would be no issue there. I repeated this same procedure for the front pattern pieces, blended in the waistline areas, and PRESTO I had front and back pattern pieces for a dartless T-shirt dress! 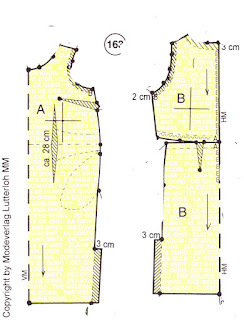 The original dress pattern has darts suggested, both front and back, but I knew from my experience with the first dress that with the right fabric I may not need the darts. Sure enough, the stretchy, heavier weight knit I used, much like the original dress, did not need the darts. I do think a lighter, clingier knit would still need darts but I'll cross that road when I sew another version of this dress. 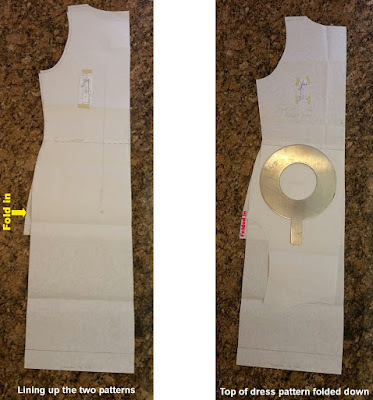 Now that I have this worked out I'm sure this will become a staple pattern for me and with the pattern drawn to my measurements it will fit better than any commercial pattern out of the envelope. See, that wasn't that difficult. I'm sure there are many more applications for combining your Lutterloh patterns if really necessary. That is one of the beautiful features of this pattern system. 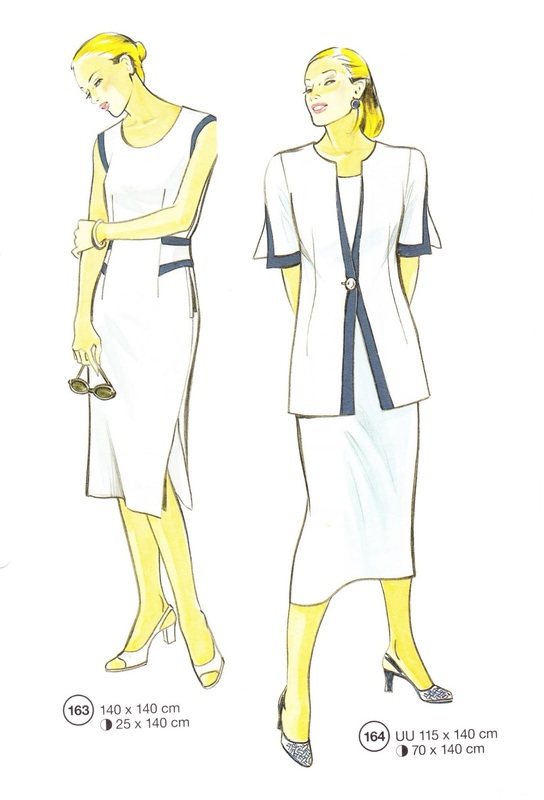 Oh, and if anyone comes across a Lutterloh T-shirt dress pattern without darts, I'd really like to know. As the weather cools I find myself in need of more exercise wear. Since I like to take my music with me this requires that my clothing have some sort of pocket. These pants certainly fit the bill but I'm not sure I like them as well as my last pair. The fit is fine, I think I just prefer my pants with pockets that don't fit so close. There was nothing unusual about the enlarging of this pattern. As long as your measurements are accurate you should come out with an easy to sew pants pattern. Just be sure to measure the length before cutting your fabric so you won't have any surprises in the end. This pattern suggests a knit fabric and I really don't think you could get away with such a close fit in a woven fabric. My knit is a cotton/poly/spandex blend and of medium weight. The spandex content is 4% and I would definitely suggest at least this much to avoid bagging out at the knees and seat area. I did make just a couple of minor design changes. Since these were intended to be casual, exercise wear I did not sew the top-stitching for the crease down the front legs. I also omitted the zipper in the pockets because I find the zipper teeth to be uncomfortable when my hand is in my pocket. These pockets are also not quite deep enough for my phone to fit inside completely so the zipper might scratch the screen. For this style of pant this is certainly an excellent pattern. 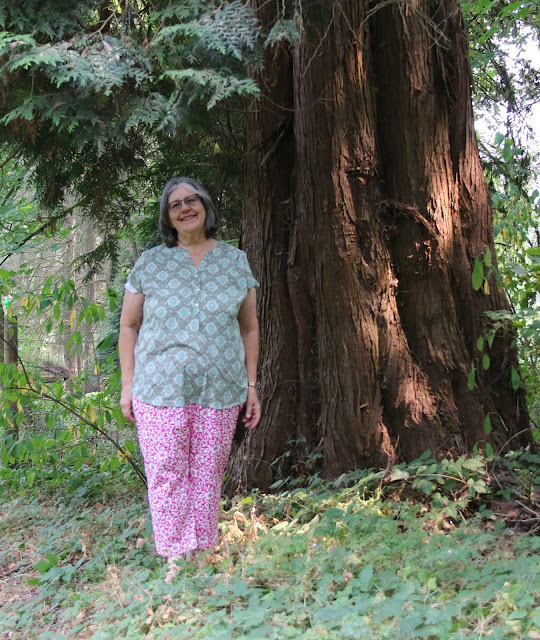 I made my usual adjustments for length and fit just like any Lutterloh pattern and ended up with a nice pair of very casual pants. I may make another pair with deeper pockets and include the zippers for safety when biking. My next project is already underway. I cant seem to put away the last pattern for this dress. I've cut out another short version in this fabric. The contrast bands will probably be a black and white stripe but they're not cut yet so there's still time to change my mind ; ). So, that's my plan for my next project, what's yours? The Lutterloh pattern needed some work. keep going up to larger and larger sizes. It made all the difference in fitting a pair of pants. I made a crotch curve adjustment and was very glad I did. you need less fabric than you think. If you are tall well maybe more fabric! I added elastic to the back waist band. it was just too loose. band would be in order. Perhaps more darts and smaller darts in the back too. I think I would shorten them more. them to match the pattern drawing. Let's hope there is enough summer left to enjoy them. I recently inherited a bunch of fabric from a dear neighbor and as soon as I saw this fabric I knew exactly which pattern to use. This turned out to be a very comfortable pullover type dress with enough style to dress it up for evenings too. There are a few pattern pieces to draw for this dress but in my opinion it is well worth the time. There is one error on this pattern. The arrow in the photo below points to where there is a number missing. There are ten dots to draw for the back piece but only nine numbers. I just drew a line perpendicular to the center back at the same level as the dot on the opposite side. My fabric is a medium weight knit interlock with fine ribbing for the contrast bands. I'm sure many knits would lend themselves well to this pattern. I'm thinking of a sweater knit with long sleeves for a Fall into Winter version. You might even get away with a very stretchy woven as long as you install the side zipper. For the contrast bands I would suggest a fabric with a good amount of stretch and excellent recovery so the waist band can hold the weight of the full skirt without distortion. The only design change I made to this pattern was to leave off the side zipper. My fabric was plenty stretchy enough to slip it over my head. I do have a few design changes planned for future iterations of this dress though. 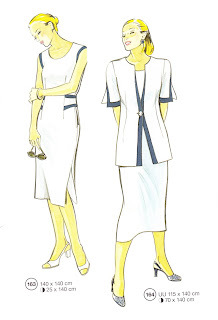 I can see this becoming a staple pattern for me by switching out different sleeves and skirt shapes. The shape of the skirt and the bodice of this dress are so appealing to me that I already have plans to make it into a short dress to wear with leggings and even a top to dress up some jeans. With the ability to exchange skirt and sleeve pieces this pattern becomes endlessly versatile. It needed a simple line pattern. Something that would show off the lovely blocks of color. This is the pattern I choose. to make the fabric pop out at my hip. They have cried out to be used. So glad this dress made up quickly. The fabric has lots of gold lines on it very pretty. There is a zipper in the back and a side slit. and it helped pull in the fit. I loved the shape of this dress. It wasn't straight and leaves some nice movement wrinkles. patterns I would always do! Now to work on my flabby arms. Hand me my 3 pound weights! I considered the over jacket but what fabric would ever do this fabric justice? Hello again folks. I'm posting this late because I just started a new job! I've started working in a new chocolate shop and they told me I should wear whatever apron I like until the company printed ones are delivered. I knew I had seen a standard BBQ type apron in my older patterns and this is the one I found. You may notice from the fashion drawing that this pattern has a designation letter of W for apron. This is actually a letter that is no longer used in the current symbols key. I guess we modern folks just don't wear aprons as a standard accessory anymore. It was nice to see that this pattern actually uses the regular Lutterloh dot to dot type format rather than just a drawing with approximate dimensions listed. This makes for a nice smooth curve instead of having to guess at it. You still need to estimate where the placement of the pockets should be but at least you can get a custom size in case you're sewing for a particularly large or thin person. So many of the one size fits all aprons you see for sale just don't fit everyone. For my apron I chose a medium weight cotton/polyester twill that I dyed pink just for fun. This should hold up to plenty of washings and the polyester should help it repel stains. Any fabric that is considered a bottom weight should work great for this pattern. I actually already have another one cut out in a pinstripe denim for a gift. The pattern for this apron suggests a pre-measured strap for the neck. I wanted mine to be adjustable so I added a small loop where I could attach two D rings for adjustment. I liked the large pocket on the bottom that is divided by topstitching but I only needed a small pocket at the chest for my candy thermometer. Overall I'd say this pattern is a keeper. I'll keep it around to use for gifts since it should fit most people of average build. If I need one for someone who is much larger or smaller than myself I can always draw up a new one. Once I get settled in this new job I hope to get to some more exciting sewing projects but we'll just have to see how that goes. Sometimes our sewing has to take on a much more utilitarian nature doesn't it? Hello again, here is my version of this comfortable short bathrobe. My winter robe was getting too warm to wear most days so my goal with this pattern was to end up with a loose fitting robe in a lighter fabric. Yay, mission accomplished! This pattern was plenty easy to enlarge to my size. My only complaint is that I wish there were a shorter version of the back piece so you didn't have to draw out the longer version and then shorten it. Since the pattern page includes a short and long version of this robe you need to draw the full length back pattern piece and then shorten it. The red arrow points to where you should fold the pattern by the suggested amount. I ended up matching the side seams and folding the pattern to match the front. This did end up being right about the 35 cm as suggested. This floral print fabric is a 100% cotton terry cloth and the white terry is a cotton poly blend. Other than some major shedding this fabric was a dream to work with. I got it for a steal at a rummage sale last Summer. Fortunately I had just enough to eek out the most important pieces. I did have to use three shorter lengths to piece together the tie belt but the busy print hides all the seams. This robe is pretty basic so could be made up in just about any fabric that you like. Fleece or flannel would be nice for Winter and any cotton or perhaps gauze would work nicely for the warmer months. I'm sure even a knit could work if that floats your boat. There isn't much shape to this robe so I didn't bother with any design changes. I did have a really hard time turning the super long tube of fabric for the belt so I cut my second one a little wider than the 4cm suggested by the pattern page. This pattern was exactly what I anticipated it would be. If you need a really basic, everyday robe, this pattern is for you. My next one will likely be a long one with some shaping and nice details but I'm sure this one will last me a good long time. 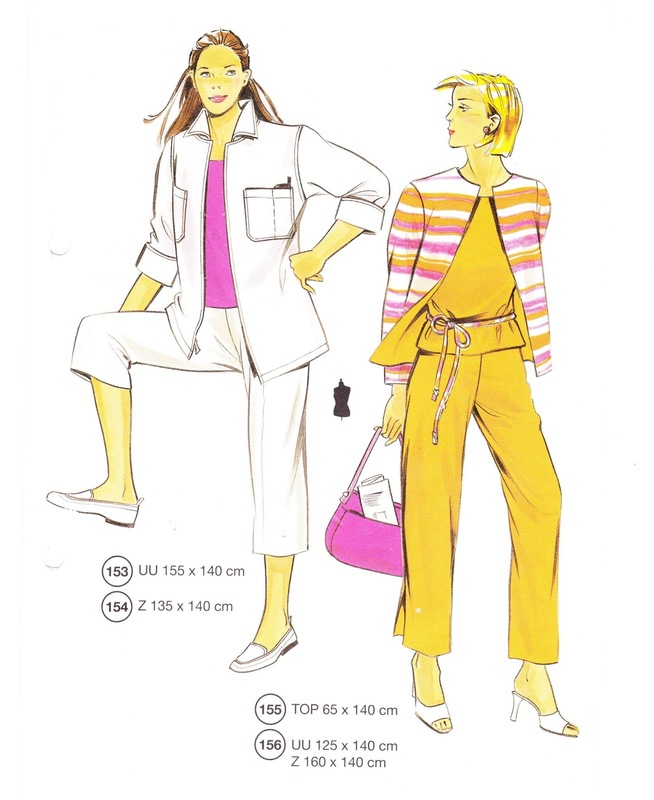 I've been perusing my vintage Lutterloh patterns lately so my next project may be one of those. I hope you're all finding some time for yourselves. This is a nice top for transitioning from Winter to Spring. Depending on the fabric and trim you choose this top can easily be dressed up or down. My version in rayon knit with lace sleeves is definitely ready for warmer weather. This is the second Lutterloh pattern this year that has sewn up too big for me. Not an issue really since the seams can just be taken in but notable in that it might be something to look out for on my next few projects. I've taken new measurements (smaller than last year) so it's not likely that's the problem. I'll report back if this starts to feel like a trend. Other than the issue with perhaps too much ease for my taste this pattern draws up in a pretty straight forward fashion. 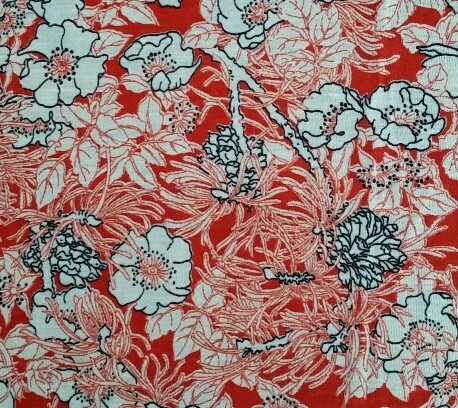 This rayon/lycra print was part of an apparel collection at JoAnn's Fabrics at some time. I ended up with the remnant at the end of the bolt. The one yard piece wasn't quite enough to squeak out the sleeves so I used an equally stable stretch lace. The lace sleeves are what relegate this top to a transition piece. Those sleeves don't offer much protection from the cold! This pattern does not specifically suggest a stretch fabric but I would suggest one with some drape to it. The tie opens plenty wide enough to fit this over your head so a woven could be used. There were no significant design changes to this top pattern. I did use a double faced satin ribbon for the neck tie and omitted the sleeve cuffs in favor of elastic in a casing. The only major difference to my version is that I had to take mine in by 1/2" on each side seam. I had already cut the fabric with no seam allowances to compensate for my stretch fabric but it was still too shapeless. Mine looks closer to the model's now with the extra ease taken out. I see a lot of potential in this top pattern. The shape is basic but with enough interest at the neckline to make it your own in lots of different fabrics. A shiny or glittery fabric could really send this over the top or just make some up in thin T-shirt knit and self ties for a twist on your basic tee. I'll definitely be stashing this pattern away for jazzing up my basic T shirt wardrobe. There's no need to wear boring tees when patterns like this one take just a couple of extra steps. To call this top oversized would be an understatement. The silhouette in this drawing looks somewhat shapeless but I forged ahead with this pattern anyway figuring I could always take in some seams to make it fit more to my liking. This pattern has quite a few pieces to draw but none of them are complicated. Often Lutterloh has us draw patterns with the princess seams connected at the cross mark. This pattern has us draw each piece separately so make sure to mark the cross point on each one. See the line drawing for the pattern pieces below. If you mark a notch at each cross point then you can use these to match up the princess seams when you sew these together. I also made notches at the waist to help align the long princess seams. It never ceases to amaze me how even separately drawn pieces line up so perfectly once the pattern is enlarged. My gray top is made from two different reversible fabrics. The solid, quilted fabric is a cotton poly blend with thin batting between the layers. The print fabric is a rayon poly blend with stripes on one side and dots on the other. These fabrics both have stretch but the thinner, print fabric has a lot more than the heavier quilted fabric. This may have been the reason I had problems with rippling when I sewed these together. I left off the top stitching to avoid any further distortion of the seams. Although I'm pleased with my extra warm version of this top I think next time I would try it in all one fabric like velour or a ponte knit. As I mentioned this pattern is rather oversized. 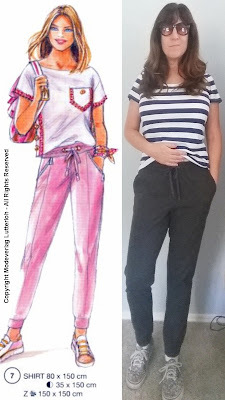 I fit mine as I sewed and found the silhouette to be unflattering when sewn as the pattern was intended. I ended up serging off all the seam allowance that was added and then serged off another 1/4" to 1/2" on each of the seams again. You likely noticed that my version is longer than the model's too. I added my usual half inch to the bodice pieces and then an extra two inches to the bottom. The last change was to exchange the funnel neck opening for a hood. I used a hood pattern from a top with a similarly open neckline and this fit just fine. Now that my family has seen me wearing this top I have decided not to make another one. My son's first comment was "It's so baggy." The only slightly more complimentary comment from my husband was "It looks comfortable." Good thing I only intended this to be a nice, warm top for walking the dog. Oh well, the pocket is handy, the fabric is super soft and the hood is perfect for foggy mornings and breezy afternoons. On to the next project then! I hope these reviews help you to decide on your next project. I'm calling these lounge-wear because, according to the US government, children's sleepwear must either be flame resistant or fit so closely to the body so not to cause the potential for catching fire from a spark. In either case I say "ewww". I just cautioned the parents of my recipient of the lack of government standards for these pajamas and figured they can decide their suitability. Have you noticed that all the flannel at the fabric store has a disclaimer stating that the fabric is not intended for children's sleepwear? 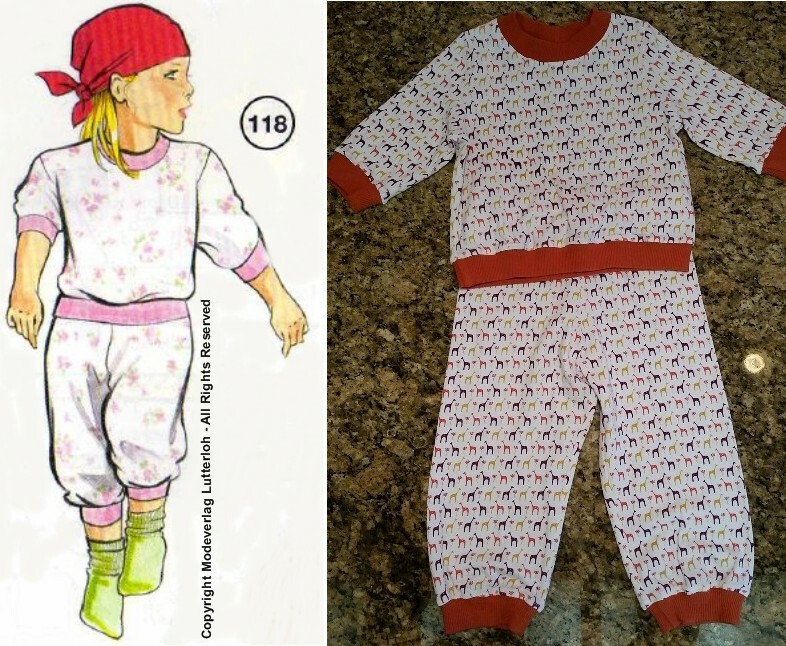 The pattern for these pajamas indicates it is intended for children 3 - 6 years old. The child I made them for is only two but I forged ahead anyway. I figured 48cm was close enough to the 50cm, where the Lutterloh scale starts. The sleeves appear to be 3/4 length in the drawing but I found them to be plenty long enough for full length sleeves once the pattern was enlarged. The tiny giraffe print used for these pajamas is a very fine, cotton rib knit. The orange bands are a poly blend with a chunky ribbing texture. The pattern does suggest a knit for this pattern so if you wanted to use a woven fabric like flannel you would likely need to add a wider neck opening either at the center front or back or perhaps at one shoulder with snaps. The only design change I made to this pattern was to use slightly wider ribbing bands. I find when making pajamas for growing toddlers this helps extend the length a little. Because the bands are tight enough around the wrists and ankles the extra length doesn't hinder their movement but it does extend the length of time they can wear them. Although not really a design change I did cut these with no seam allowances because they were drawn slightly larger than necessary. I'm pleased to have a pajama pattern that I can use as this toddler grows. 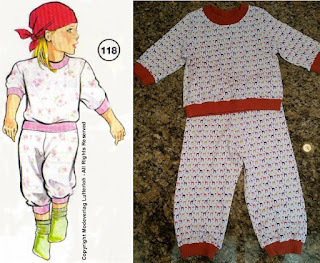 It would be easy enough to make these pajamas in a short version for Summer so it really is quite versatile. Lutterloh seldom produces patterns for the youngest children so it's nice to see a little more variety. Here's wishing you a Happy New Year. Make sure to set aside some time for yourself.